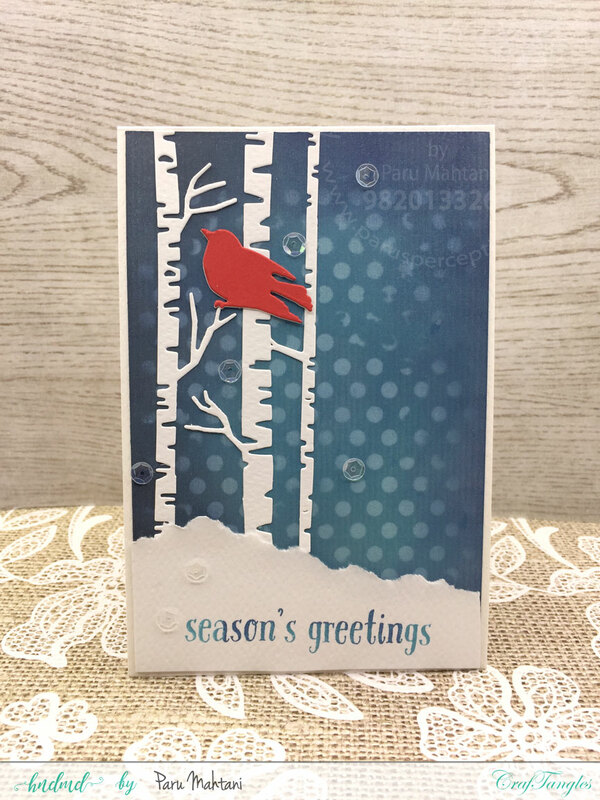 Today I have a few Christmas cards which I have made using Craftangles stencils. 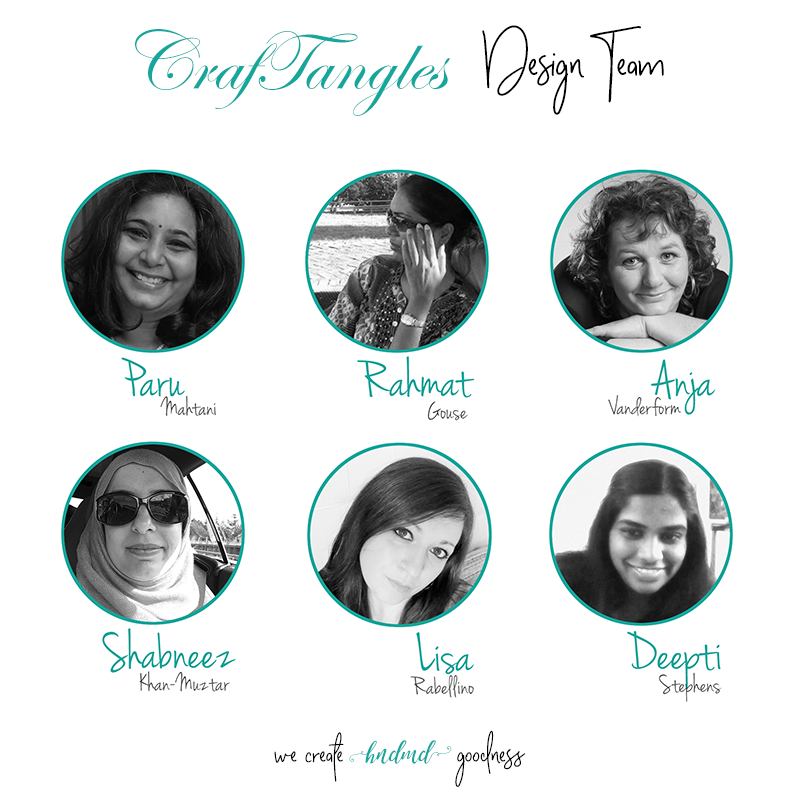 It was a lot of fun using them in different ways!! For the first card, I created a background blending together Tim Holtz distress inks and Distress oxide inks on Craftangles grey cardstock. 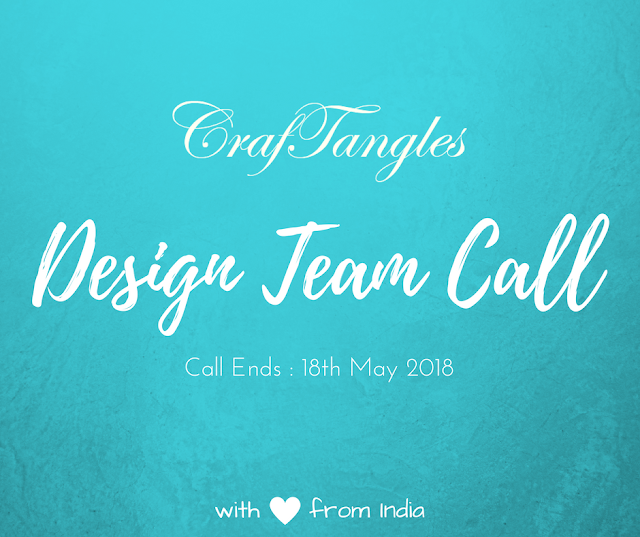 I then used the Craftangles 'dots' stencil and Hero Arts Unicorn white ink to create interest. 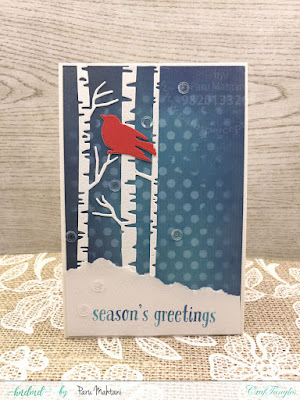 I then added a birch trees die cut, Impression Obsession birds die cut and a torn piece of white paper to create the snow bank. I finished the cards with Craftangles clear sequins. I stamped the sentiment using a misti tool and two colours of Tim Holtz distress inks, one on top of the other. For the second card, I stated by using the Craftangles stripes stencil, first in one direction and then in the opposite direction to create a checked pattern. I do not have a poinsettia stamp, so I created the poinsettia flower using a single leaf from an old Stampendous stamp set. I stamped four leaves, masked them and then stamped them again to create the poinsettia. I then embossed this flower with gold embossing powder, water coloured it, fussy cut it and popped it up on the background using 3D foam tape. I added a wooden button in the centre for interest. 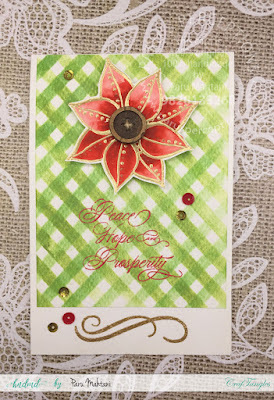 I heat embossed a sentiment from Hero arts and a swirl from a Hot of the Press stamp set. I finished the card using Craftangles ruby red sequins and gold sequins. 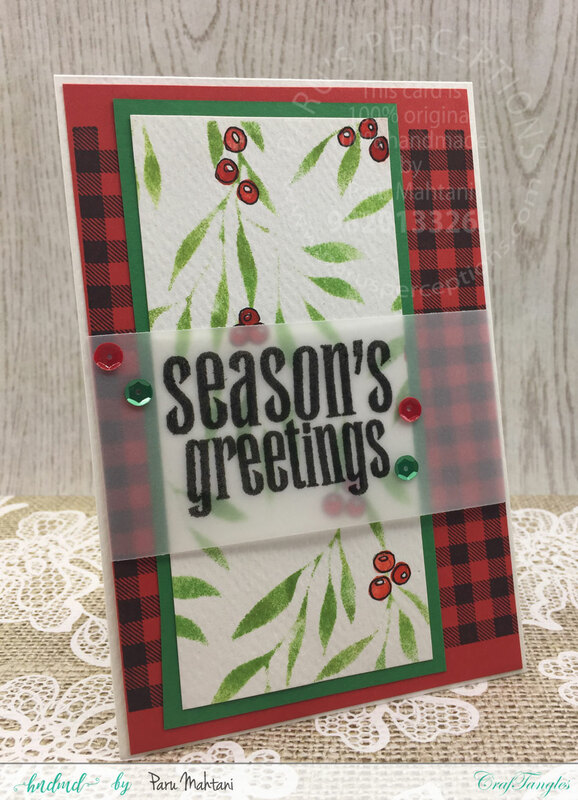 For the third card, I stamped a plaid background onto red cardstock with black ink. I then created a panel using Craftangles 'leaves' stencil and Tim holtz distress ink. and watercoloured some berries among the stencilled leaves. I then matted this panel on green cardstock and then onto the black plaid bakckground. along with some Craftangles sequins to finish the card. 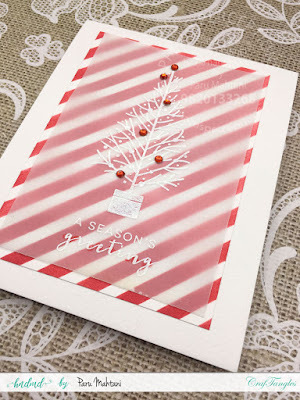 For the fourth card, I created a simple red and white background using the Craftangles 'Stripes' stencil and Tim Holtz 'festive berries' distress ink. I overlaid this background with a vellum panel with a simple heat embossed christmas tree and sentiment from Hero Arts. I finished the card with some red self adhesive gemstones to add some sparkle! this time with Tim Holtz 'Black Soot' ink. 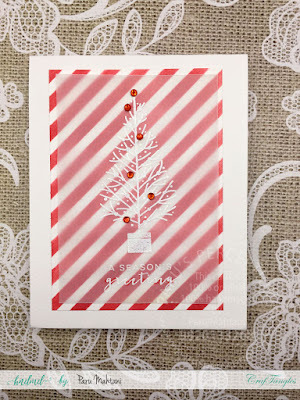 To create interest, I added some red lines using my red signo gel pen, in between the black stripes. I overlaid this panel with a vellum panel attached using black rivets. I then stamped and die cut the images (Stampendous) and added them to the card using 3D foam tape. 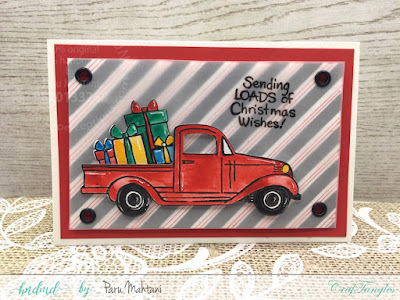 I stamped and heat embossed the sentiment onto the vellum and popped up the entire panel using 3D foam tape onto a red cardstock panel and then onto a white card base. I had a blast making these simple cards.. 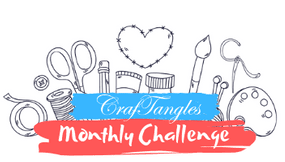 I hope I have inspired you to give Craftangles stencils a try!! !